An artisan at work in the Kaligarh workshop. Photo by Natalie M. Hayes. 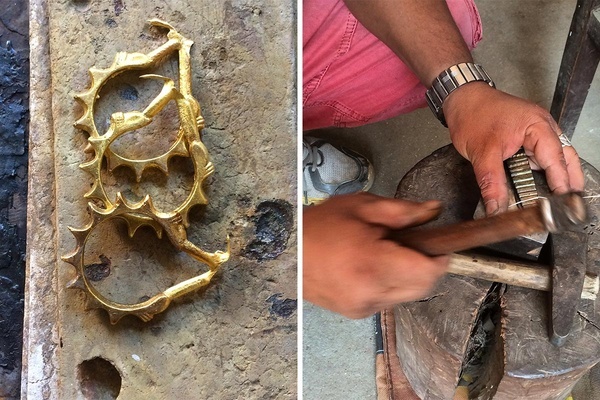 Ethical jewelry designer and Kaligarh founder Jyoti Upadhyay talks to us about her work with small-scale artisans in Nepal's Himalayan region. 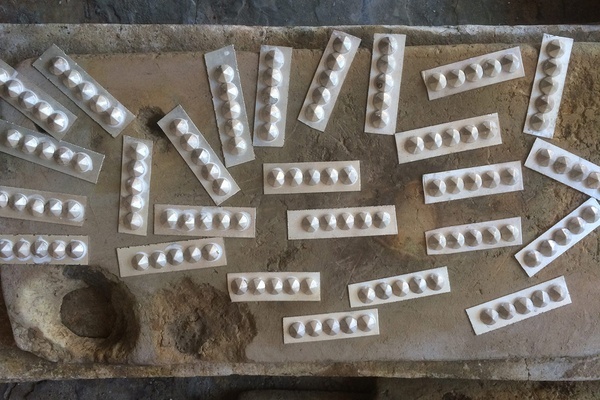 is an ethical jewelry brand based in Kathmandu and London. 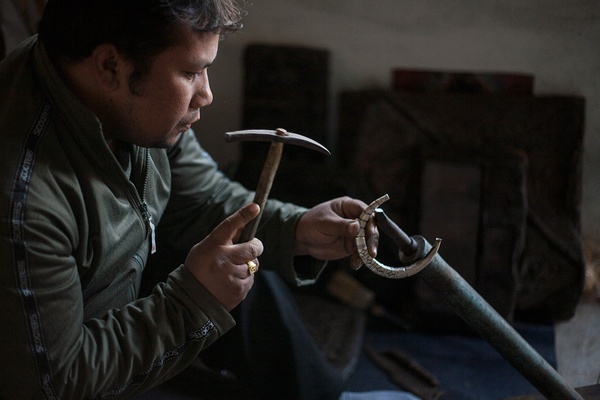 We work to support independent and small-scale artisans in the Himalayan region. Before Kaligarh, I worked in luxury travel. That involved designing and managing trips to Nepal for high-profile guests (as well as a host of other things). Before that I worked in international development. Independent and small-scale artisans. At the moment we work with artisans in the Kathmandu Valley, but are planning to expand to a few other areas in the Himalayan region. However, we're taking it slow, as deep, sustainable impact is very important to us. My mother grew up in Nepal, and my father is from India, so as a child I spent many summers in the region. One of my few childhood memories of Kathmandu is walking through the crowded marketplace around Asan and Indra Chowk, weaving through the lanes with my aunt en route to her goldsmith. She always had a ring to resize or something else to fix. He was tucked away in a small studio in a narrow alley in the old part of town. Years later, when I decided to start Kaligarh, I spent a lot of time scouring the valley to find independent traditional artisans like him. Otherwise, summers were in Eastern Nepal and Northeast India, chasing dragonflies on the roof, climbing guava trees and, inevitably, being stuffed with food by every relative under the scorching sun. I moved here in my 20s, with vague ideas of starting a social enterprise one day far in the future. That day came sooner than expected. Kaligarh artisan Ramesh and founder Jyoti Upadhyay. Photo courtesy of Kaligarh. 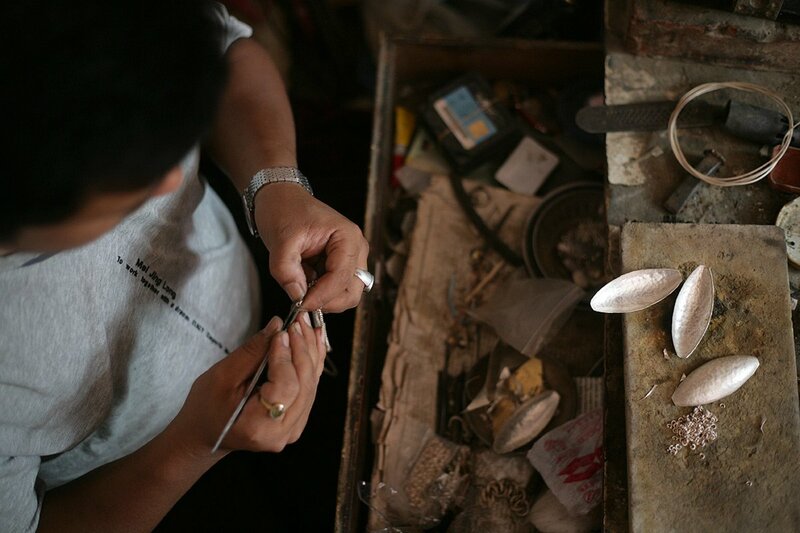 From left: Kaligarh bracelets in progress; an artisan at work. Photos courtesy of Kaligarh. What's challenging about working in Nepal? I think Nepal is the country with the most festivals and public holidays per year, and it keeps increasing — this year 51 days were public holidays. So for this, and other reasons, things move slowly here. I've learned that rather than trying to force things to happen quickly, we're more effective when I modulate my pace and let things take their course. As we say here, if it's meant to be, it will happen. Tell us about a lost-in-translation moment in Nepal. My Nepali is good, but not perfect, and whenever I try to directly translate something from English, I tend to make an epic fail. That said, most of my faux-pas happen for non-linguistic reasons. Back when I started Kaligarh and only worked with one artisan, I was at the workshop one day and mentioned that it was my birthday. The artisan seemed surprised and reacted a little strangely, but I couldn't figure out why. I mentioned it to my husband that evening, and he pointed out that he was probably waiting for a gift or a treat. In Nepal, if it's your birthday the treat is on you. Now I always buy him and his family a gift on his birthday, so he knows another custom. I enjoy the look of surprise on his face every year, and it makes me feel less rude for the first faux-pas. How long have you lived in Kathmandu? I moved to Kathmandu from London in 2009, and lived here full time for six years. These days I spend four to five months of the year in the United Kingdom and United States, where most of our business is. The rest of the time I'm in Kathmandu, working with the artisans and developing new collections. What are your three favorite things about Nepal? 1. Patan Durbar Square is one of the old centers of the Valley, and a UNESCO World Heritage site. Parts of it were destroyed in the earthquake, but reconstruction has started so I'm hopeful. It's gorgeous. 2. Our studio is a bright, beautiful space, with great shadows. The lovely is upstairs, there are art classes next door, a yoga studio downstairs, and a jazz conservatory too — so there's always music floating in through the windows. 3. One of the main advantages of living in Nepal is proximity to the mountains. I try to get out there a couple of times a year for a big trip, but also for quick getaways to the edge of Kathmandu Valley. Pieces from the Thoka collection in progress. Photo courtesy of Kaligarh. The Aaran silver band. Photo courtesy of Kaligarh. Describe a memorable moment from one of your trips. A few years ago, right before I started Kaligarh, I visited Upper Mustang. I was familiar with the hills and the mountains, but Mustang is behind the Himalayas, up on the Tibetan plateau, and I'd never seen anything like it. The landscape is so extraordinary. On the trek up to the walled city of Lo Manthang (12,500 ft.), I spent several hours walking through a deep canyon (about the height of the Grand Canyon), along dry, narrow trails covered with loose rocks. That was the first time I experienced vertigo. My shoes didn't have great grip, and I was carrying a huge rucksack. I was sure that I was going to tumble into the canyon. That trip is one that I won't forget. Has Kaligarh changed the way you think about charity and helping others? After a couple of years working in international development, I decided to move into private business. There's so much beauty, skill, and dignity here, and I feel that the charity or international aid sector often undermines these rather than making use of them to improve people's lives. What's your advice for entrepreneurs who want their businesses have an aspect of global giving? In this era of buzzwords and superficial taglines, don't submit to the urge to oversimplify your ethos of giving back. Having come from an industry where this is often the norm, I am particularly wary of this. Life is complicated; take the time to engage with the community or issue you're giving to in order to understand the best way to help. I believe there is merit in doing good without shouting so loudly. Be humble and respectful. Do not exploit anyone's story to sell a product. I hope we will have really expanded the audience for Nepali design and craftsmanship, thereby creating more opportunities and giving hope to artisans and young people here. A state-of-the-art workshop with lots of sunlight would also be nice. Where did you travel last? We were closed for a week over the festival of Tihar in late October (known as Diwali in India), so I escaped to Assam in northeast India (yes, where the tea comes from). I have relatives who live on the banks of the mighty Brahmaputra, a river that I'm totally fascinated by. The silk weaving in Assam is exquisite, and I’d love to work with artisans there. Something for the future. A Kaligarh artian at work. Photo courtesy of Kaligarh. 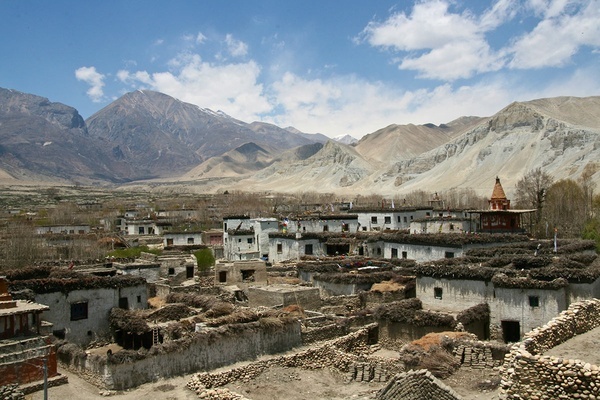 Tsarang, Upper Mustang. Photo courtesy of Kaligarh.